We left the festival feeling excited and eager to get on with our tour of the Outer Hebrides. Everyone we had spoken to had told us that the islands were beautiful, wonderful, a magical place, that we would love them. No one said anything about bad weather – some had had a couple of days of rain, but nothing really awful. They were all so enthusiastic about it; we were really looking forward to it. 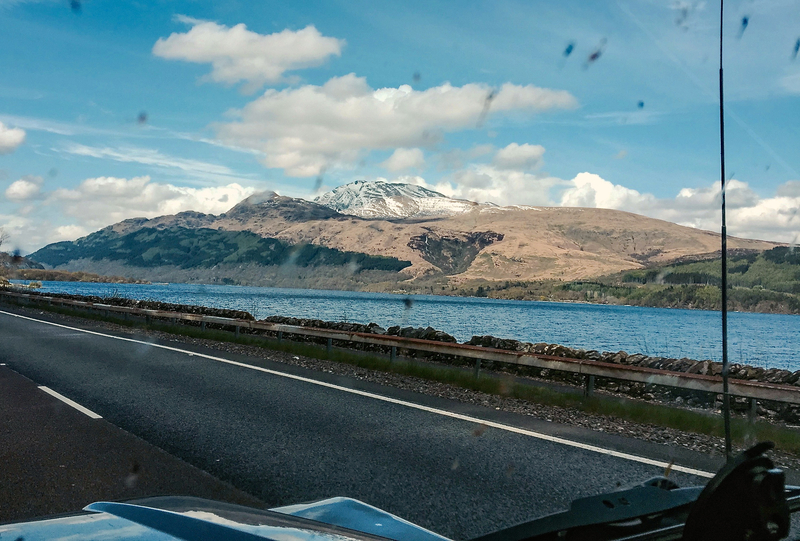 The drive up there was good – the sun was shining, the sky was blue, the traffic was good, the scenery was beautiful, there was even snow on top of the mountains. All was well with the world. We were on our way at last to visit these beautiful islands, something we’d longed to do for years and we were now going to cross it off our bucket list. Whoa, hang on a minute! We were getting carried away with the euphoria of talking to like-minded people at the festival and forgetting our usual holiday luck – BAD WEATHER. The joke in our family is never to take a holiday at the same time as us. It has even been suggested that we visit dry, arid places in order to end their drought and bring them rain! Everyone finds it amusing, but after years and years of soggy, waterlogged holidays, the joke is wearing a bit thin for us!!! We pitched up at the campsite just outside Oban and, ominously, the skies were beginning to darken. It started raining in the night, and it continued to rain and rain and rain – solidly for the next 24 hours or so. The next morning the ferry to Barra was cancelled due to the adverse weather (we’d signed up to receive text alerts on the sailings) and we spent the morning sitting it out in the tent. 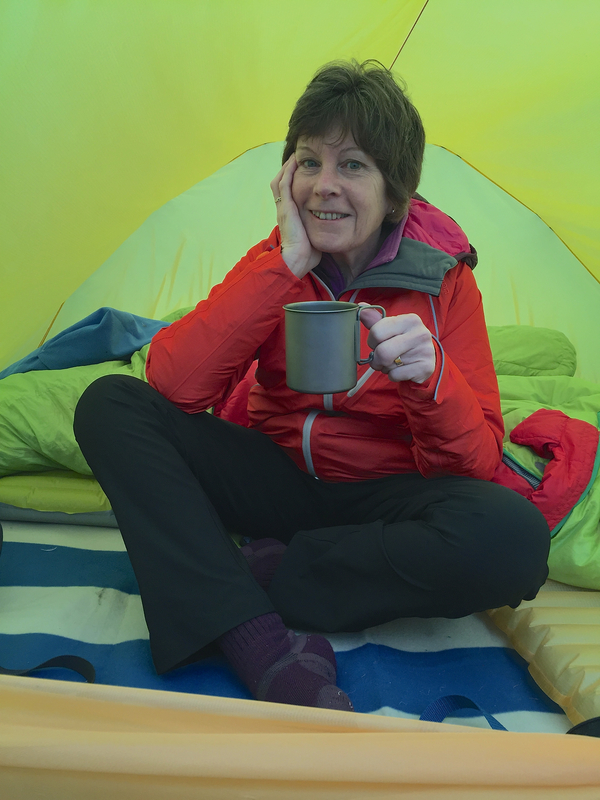 The ground outside was beginning to squelch and large puddles were forming around the tent. In the afternoon, we went into Oban and visited the CalMac ferry office. We had planned to buy a hopscotch ticket but, in view of the weather, we decided the best bet was to purchase the ferry tickets as we went along, just in case we had to bail out and backtrack. Oban campsite – we’re surrounded by tin tents! We spent the evening sat in the car, pouring over all the weather apps we could get our hands on. It wasn’t looking good. The forecast up to the weekend was for heavy rain every day, but even worse were the strong winds, with gusts over 46 mph predicted. Not exactly safe cycling weather! What should we do? We discussed and deliberated. We had been planning this trip for several months and were really looking forward to it. Should we chance it, pack up camp, put the car in storage and go for the ferry, only to find it cancelled at the last minute? Should we be sensible – and safe – and pull the plug on the whole trip? Are the forecasts really reliable? Suppose we don’t go and then, a few days later, we see the weather has perked up? We would be absolutely kicking ourselves and cursing our caution. We decided to go to bed and sleep on it. 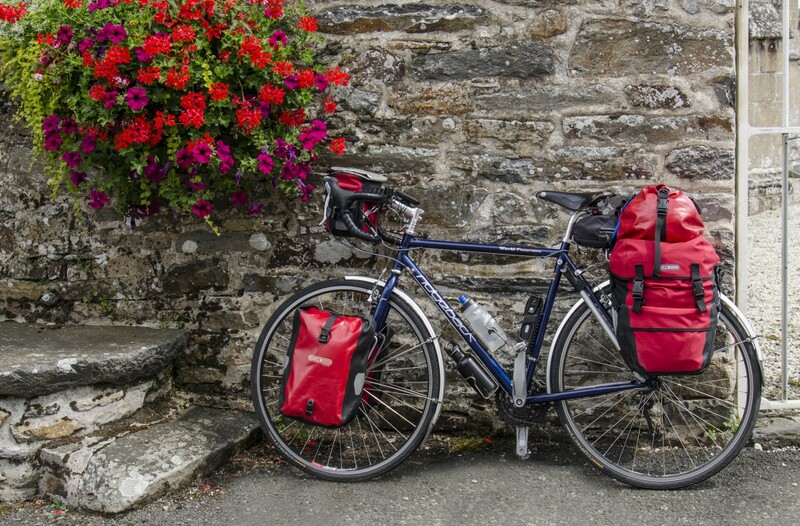 Categories: Bike, Bike packing, Camp cooking, Camping, Cycle camping, Cycle touring, cycling, Holiday, Mike McEnnerney, photographer, Photographic, Photography, PhotoLink Images, Scotland, thepedallingphotographer.com, Tourism, Travel, UK, Vacation | Tags: Bicycle, Bicycle touring, Camping, Cycle Camping, Cycle touring, cycle tourists, Cycling, Holiday, Mike McEnnerney, outdoors, Outer Hebrides, Photography, Scotland, The pedalling photographer, transportation, Travel, Travel and Tourism | Permalink. I can’t bring myself to ‘like’ this post. Gutted for you. gutted for you. its wonderful up there but we have had that sort of weather and you probably did the best thing. lucky you weren’t sea kayaking. How sad 😦 So frustrating when that kind of thing happens. Yes Pete it is but, hey, on with plan B! !